GMMI IMG International Career Medical Insurance is a great investment when residing overseas. 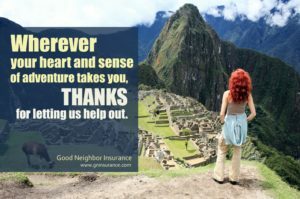 Good Neighbor Insurance has provided IMG overseas health insurance benefits since 1999 to our clients. There are many reasons why we like the GMMI plan and we have some of the benefits listed further below. But we want to draw your attention to one of the great benefits of the GMMI plans. Here is some great information, shown below, about the special billing program that IMG has created for hospitals throughout the world. Below we have examples related to Bangkok, Thailand. In Bangkok, Bumrungrad International Hospital is one of the best providers we work with. We have a very good relationship with them and they know our polices extraordinarily well. We just had one of our organizations, who use our IMG group insurance plan, in the office the other day and the group administrator for them raved about service her associates received there. They advised that the care was better there than in the U.S. Bronze – The Bronze option is designed for the budget conscious consumer who seeks to have emergency global medical insurance coverage. It has a unique design specifically for areas of the world with low medical costs. If you are looking for highly affordable insurance, this international medical coverage helpful to have. There is a lifetime limit of $1,000,000. Silver– This option provides affordable medical security designed for the more budget-conscious consumer. With $5,000,000 of lifetime coverage, Silver offers a wide range of scheduled benefits equipped to meet your essential needs. Gold– Ideally suited for those who desire full major medical coverage, but for a limited period of time. Gold provides comprehensive benefits for the first three years of coverage and then certain benefits are reduced starting on the 4th year. This plan is best for those who are going to be outside the U.S. from 1 to 3 years. Gold Plus– Comprehensive major medical plan designed for people who need long term coverage. This is just like the Gold option but all the benefits stay the same no matter how long you stay on the policy from 1 to as many years overseas as you need and desire. Thus, benefit levels continue beyond year three as long as the coverage remains in effect. Platinum– This option provides the superior benefits package for the most discerning global consumer. Platinum offers enhanced benefits and services with $8,000,000 of lifetime coverage. It is designed for the client who wants the convenience of comprehensive medical, dental, and vision benefits in one plan. The elite Platinum option also offers members access to our exclusive Global Concierge and Assistance Services and has a maternity benefits option. For more questions on the GMMI IMG plans, https://www.gninsurance.com/gmmi-career-long-term-insurance-plans/, please connect with one of our professional international health insurance specialist here at info@gninsurance.com or at our toll free number – 866-636-9100. Or you may call our office in Arizona at 480-633-9500.